Irene “Jeane” Ronowski, 85, of County Highway B in Belgium died Wednesday, August 18, 2004 at Columbia St. Mary’s Hospital – Ozaukee Campus in Mequon. 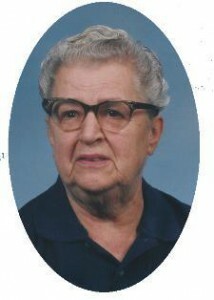 She was born on September 18, 1918 to Frank and Pauline Grandezski Ronowski in Milwaukee Wisconsin. She worked for and retired from the Oster Company. She was a kind person who enjoyed life’s simple pleasures. Jeane is survived by her sisters Florence Ronowski of Belgium, Joyce Oerichbauer of Eagle River, Wisconsin and Martha Quartemont of Sunnyvale, California. Further survived by nieces, nephews, other relatives and dear friend Theresa Gillich of Port Washington. Memorial Mass will be celebrated by Rev. Neil Zinthefer Noon on Saturday, August 21, 2004 at Holy Rosary Parish – Holy Cross Chapel. Family will receive friends after Mass at fellowship.